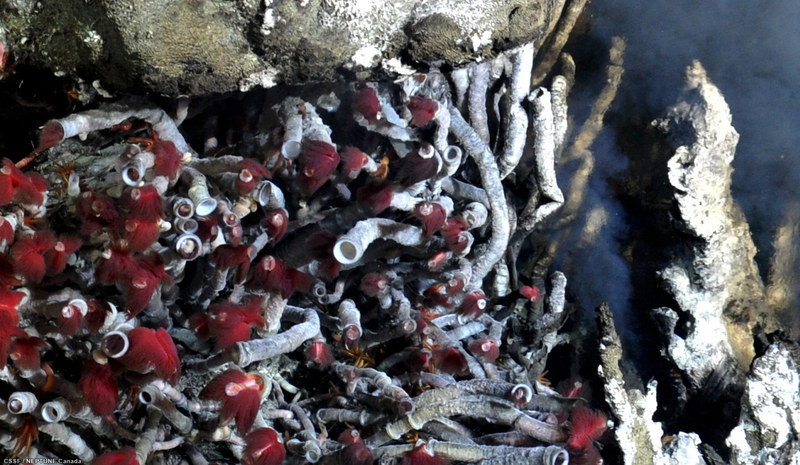 Located on mid-ocean ridges, hydrothermal vent ecosystems are characterized by extreme environments and unique organisms, which don’t depend on sunlight. Photosynthesis is the way plants usually convert energy to food, but deep-sea hydrothermal vent communities are sustained by a special group of microorganisms, which carry out a process known as chemosynthesis. This allows the bacteria and archaea to produce organic matter for themselves and larger animals using energy from chemical reactions that occur as superheated mineral-laden hydrothermal fluids mix with seawater. Many of the species found here are endemic to these extreme deep-ocean environments. Several studies have shown that the distribution and composition of vent communities are strongly influenced by local geological, physical and chemical processes. We know very little about the day-to-day life of hydrothermal vent organisms or how these particular ecosystems evolve over time. Endeavour has been the site of intensive investigation for more than 20 years and was officially preserved as the Endeavour Marine Protected Area (MPA) in March 2003. Endeavour Node is the hub for a dynamic network of instruments deployed at several Endeavour hydrothermal vent fields: Main Endeavour Field in the centre, Mothra to the south, High Rise and Salty Dawg to the north. Within these fields, hydrothermal vent edifices with their sulfide towers and black smoker chimneys are given fanciful names like Hulk, Crypto, Dante, Grotto, Godzilla and Faulty Towers. Four instrumented moorings mark the corners of a rectangular box around the vent fields, with mooring arrays positioned to the northwest, northeast, southwest and southwest. Some of the instruments deployed at Endeavour relay a constant stream of real-time data monitoring heat flux dynamics, dissolved minerals, current flow, micro and macro-organism behavior and population, and seismic activity.